"I've done it again? I only wish I knew what I was doing." Gilligan was born in a small town in Pennsylvania. He had a turtle named Herman, and pigeon-toed Walter Stuckmeyer was one of his friends. His best friend was Skinny Mulligan. Gilligan once worked in a gas station, and was president of his 8th grade camera club. 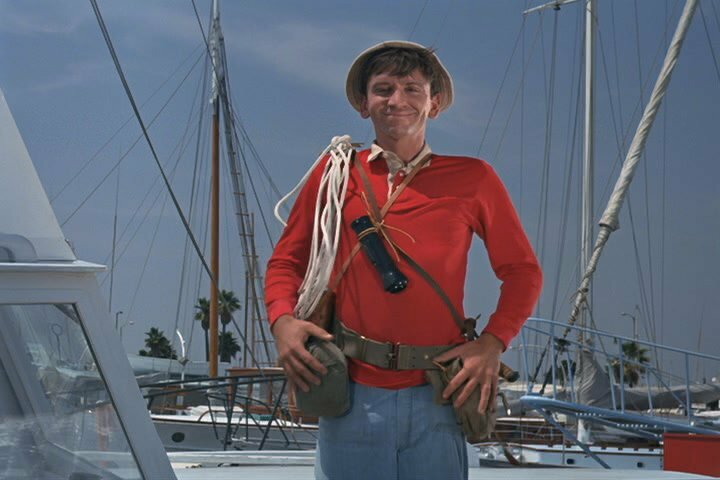 In every episode, Gilligan manages to ruin the castaways chances of being rescued. Whenever he tries to help, he always ends up doing more harm than good. Why don't the fellow castaways kill him? The only explanation is that he's won the affection of his fellow castaways, and plus, he is the Skipper's little buddy and does most of the unpleasant chores on the island. However, he is very content on the island, as he has everything he needs: attention, freedom, adventure, and above all, a loving substitute family. Even his favorite Rock Group the "Mosquitoes" showed up. The only thing he really misses is television, hot dogs, and licorice. He loves animals and always has a pet on the island. Oh, he also loves chocolate-covered hamburgers!